Happy 9th anniversary, Lord of the Rings Online! Today marks the 9th anniversary for Lord of the Rings Online. I’m not playing that game right now, but it’s always on my harddrive and always updated- and i’m always this close to launching it. I wasn’t there when it launched, i joined in january 2008, if my mail history is any indication. So the game existed for about 9 months before i joined- ha, can’t imagine waiting that long to join a game nowadays. It was also the second MMORPG i played and for years to come, it would be my backup game. 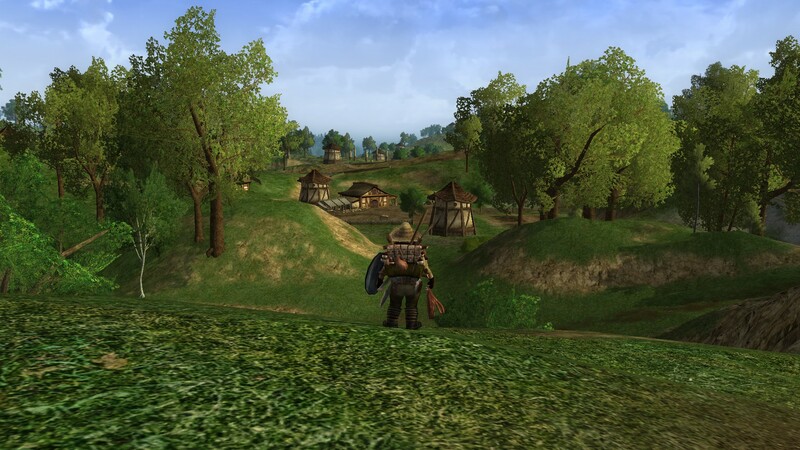 In times when many returned to World of Warcraft from whatever new disappointment they tried to replace it with, my home base has always been Lord of the Rings Online. There are two things that have enticed me to return many, many times- there’s the community, for one. It didn’t matter at what time, language or server type you looked. The community of Lord of the Rings Online has always been on the nicer side of things. In Codemaster’s and later when Turbine published it themselves in the EU, german or english servers, US or european, when it was pay-to-play and later when it became free-to-play. 8 years ago or now- the players in Lord of the Rings Online are of a friendly and relaxed type. Considering i mostly left World of Warcraft because Damage meters went from being a fun statistic to evaluation software and because the community became more rough in general, Lord of the Rings had me covered. Then, there’s the world. When i began playing, the world Tolkien created wasn’t in my “top-list” of fantasy worlds, anymore. In books, i had tasted the gritty to grimdark worlds of George RR Martin and- i think- Joe Abercrombie and preferred their creations, knowing that as far as complexity goes, Tolkien topped both of them. But i still had a love for the Shire, especially, and i liked Middle Earth enough to appreciate the chance to walk around in a virtual version. I’ve had all kinds of warm und fuzzy feelings when i saw the ring symbol as quest marker above NPCs heads, or venturing into the old forest in those early days when it had no map and was a dangerous place to adventure in. I can’t tell you how many times i got lost in that forest. The Shire, of course, beat everything. On my first character, an elf, i travelled to the Shire as soon as i got the quest to go to Bree. I didn’t know better, or maybe it wasn’t possible to use quick travel at that time, so i walked there- and it was epic. Seeing the Shire, of course, made it all worth to me, and soon i found myself listening to an audio play of Lord of the Rings again. Whenever i return, hear the first ingame sounds, do the first few quests, i simply love being there. Lotro is one of the most open MMORPG themepark worlds out there and it is a joy to explore, and take your time to see everything and craft a bit. It was a bit more comfy when Bree was still the social hub, which i guess moved on with all these expansions released for Lotro. It’s hard to put the finger on what makes Lotro so different compared to its contemporaries- it is quite easy to solo nowadays, it offers a skill tree selection very similar to what World of Warcraft had before Blizzard found that too complicated, it has a quest marker and it’s quite difficult to get a group running for lower level dungeons (it’s possible, though), but if i were to look somewhere, i’d look into the world design- it’s big, open and full of detail. If you love wandering virtual worlds, this game is a great way to spend your time. I never “left” Lotro, i believe i never will. Instead, somehow i still maintain the hope of seeing all the zones one day. I bought a level 95 character, thinking i’d take her around the world, but it was confusing- as those bought maxlevel characters always are. I guess the difficult part is that now, in Elder Scrolls Online, i find many things quite similar to my experience in Lotro- the detail, the love for the lore, the world-design, but Lord of the Rings Online will always take a special place in my MMORPG heart. I do hope it will make another 9 years or more, because i know one thing: as long as i can, i’ll return and visit middle earth from time to time.